There's a statement on the Poseidon's box that says it's 'not just a case'. I'm not entirely sure what I was expecting - maybe Poseidon himself would come leaping out of the box and running around the office, trident aloft? It's not a bad-looking case, a bit like Darth Vader's fridge, with a nice, heavy, brushed-aluminium front door and a mildly sinister lighting system. It has an interchangeable side panel, which can be switched between metal gauze for cooling and a perspex window for gazing at the pretty lights within. The case also includes a 9in back fan with some of the aforementioned pretty lights, and there's an additional fan at the front to blow cool air over hard disks and maintain front-to-back throughflow. The only downsides are the drive bays, which use rather flimsy metal teeth on one side of the drive to lock it into place. So the Poseidon is actually just a case, and the box is essentially lying to us. 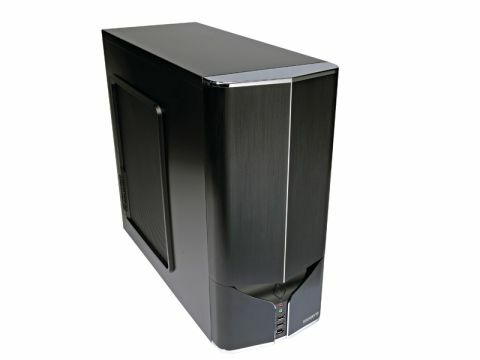 For a mid-priced case, though, it's remarkably solid, and perfect for a budget build. Just don't expect any surprises. Or Greek sea gods.